You have to admire what Michael Mina and Marc St. Jacques have done to this venerable seafood-er, tucked away for over twelve years now in a corner of the Bellagio Conservatory. Since the departure of Anthony Amoroso a couple of years ago, this place has struggled to find its sea legs as the ebb and flow of a choppy economy have threatened to leave it floating adrift as it navigates an ocean of heavy tides and difficult sailing. (Block that metaphor!) In other words: Michael Mina (the restaurant) has been searching for an identity ever since our economy hit the skids. Originally opened as Aqua, it was an offshoot of a world-beating restaurant in ‘Frisco featuring a hot young San Franciscan chef with an Egyptian last name. In its original incarnation, it was all about expensive things that swim, whole lobes of foie gras, caviar tastings, a lobster pot pies, and a wine list whose prices would choke a horse. (Mix that metaphor!) 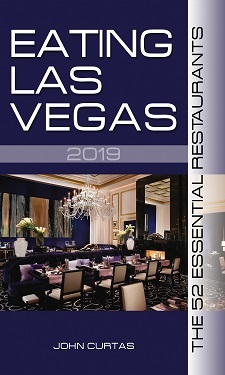 In 2002, Mina split with the Aqua group, retaining his interest in his Vegas restaurants, and promptly renamed the restaurant after himself. The menu, however, changed little in the ensuing years, retaining its focus on seafood and many of the signature items that made Mina famous. Through it all, though, some things have remained constant. The Tony Chi-designed room is still as sleek and elegant as it was in 1998. Everyone seems to look good amongst the blond woods and muted lighting. The semi-open kitchen has always attracted top talent, and the wine program — regardless of what you might think of the prices — has always been rich with white wines from around the globe that compliment this cuisine. These days, that wine program is supervised by M.S. Joe Phillips (formerly of Sensi) and like our economy, it has been brought back to reality. Phillips told us his list is now focused on small producers from around the world, meaning the list is peppered with plenty of affordable bottles, and you’ll be tempted to order a couple, since two good labels can easily be had for what one used to cost, i.e. around $150. Of course, if you want to blow 22 grand on a bottle of DRC here, he can help you with that too. Aside from the wine prices, the real surprise is the re-jiggering of the entire menu. While not exactly going downmarket, MM is now a place that doesn’t intimidate. Seven starters and mains are offered, and quelle horreur, only half of them are seafood. Those wanting to drop a Benjamin+ on the lobster pot pie or whole lobe of duck liver can still do so, but you can make a beautiful meal out of a platter of hamachi crudo ($21) followed by a truffle-stuffed Jidori chicken ($36) or a enough braised pork short ribs to feed two ($39) and feel like you’ve actually gotten a bargain. This is a leaner and meaner Michael Mina. Gone are all the trios (and their exotic presentations) that defined his style for over a decade. In their place is something akin to comfort food, using the best groceries, but still plated beautifully. That hamachi crudo is flawless, as was a playful dish of what St. Jacques called “Brazilian ceviche” — fresh yellowtail blanketed with a coconut foam to be served on a squid ink cracker with popcorn(?). “That’s the way they do in Brazil,” he told us, but we were too busy scarfing it down to pay much attention. This was one of those “we’re going to strut our stuff for the critic” meals, so the plates kept arriving far beyond our ability to appreciate and discern the fine points between them. Our actual hunger was fully satisfied somewhere between the decadent, whipped foie gras with huckleberries and the intensely crabby Dungeness crab tortellini. Neither dish was anything like the previous, almost Japanese-like sensibility of this place, but both provided the right measure of rib-sticking warmth on a cold winter’s night. Equally substantial, but less successful, were the twin, deep- fried quails. The batter provided too much crunch (and held too much oil) for this palate, and overwhelmed the sweet gaminess of the birds. Aside from that misstep, the rest of the menu showed the careful cooking for which Mina and his minions are famous. Sturgeon is presented like two, encrusted fish sticks and could make anyone a lover of this bottom feeder….although the $42 price tag might raise an eyebrow or two. (It also would’ve benefited from more than a schmear of the refined sauce gribiche that came on the plate.) A better deal is the aforementioned braise pork short rib(s), presented on a bed of Anson Mills grits (polenta), and beautifully glazed with pork hock jus flavored with quince. The menu pays one nod to its past with a “Three Seas” trio of Japanese fish, that was so beautifully composed and delicately-flavored, it could’ve come from Bar Masa. Desserts have been simplified as well, but they wisely kept the root beer float with warm chocolate chip pecan cookies on the menu, or ELV would’ve throttled somebody. In re-positioning his namesake, Mina is seeking to distinguish it from his two seafood emporiums (American Fish and Sea Blue) and the excellent Nob Hill, while maintaining the upscale élan that made it and him a household word in the food world. The new Michael Mina is a simpler, gutsier affair (and less of a wallet bender), but no less beautiful than it’s always been. The new menu straddles the line between what it was and what it wants to be, and if Mina can pull this off (and the crowds here seem to indicate he can), then he’s even more of a wunderkind than we thought he was. ELV’s meal was comped. He left a $100 tip. Dude! What about the butter?!?! Hmm. The Foie Gras dish with Huckleberries is hauntingly similar to a dish created by a very good friend of mine. I suppose great concepts are to be shared. In any case, I give them credit for re-focusing the menu and prices. Is the quality of the desserts/sweets at the level of the former Pastry Chef?